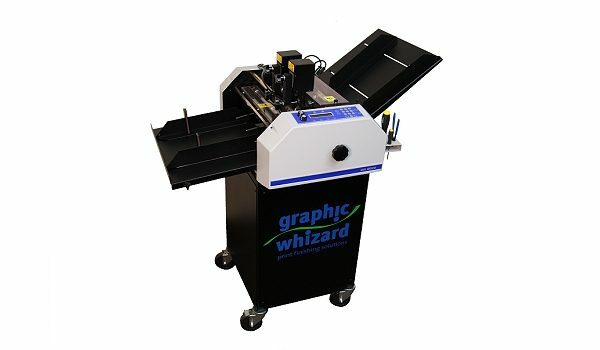 Most popular number/perf/score/slit machine in the industry. Operating at speeds up to 6000 sheets per hour, the “6000” makes fast and easy work of finishing needs. With the ability to upgrade to another model at any time in the future, combined with a 5-year limited warranty, you can’t go wrong with the “6000”. A 100-job memory provides a fast job change over. Microprocessor controls give the operator the ability to position up to 100 numbers per head, anywhere on each sheet. Feature for feature, spec for spec, it is the best value in the industry. If productivity warrants it, the 8000 can be easily upgraded to an 8000P or 12000 on your floor with limited downtime. Identical to the 8000E, the 8000P adds pneumatics to the mix. Pneumatically propelled numbering heads provides for “extra-long” numbering run length, as well as the ability to add the optional strike perf attachment. This fully automatic, pneumatic numbering system with double shafts (DS) gives users greater productivity and versatility. Now, a four-up job can be numbered and easily processed with only a single pass through the machine. More productivity equals more profit. With features similar to the “8000”, the “12000” adds higher production speeds while maintaining register and accuracy. From the 30 inch-long register board, to the individually pressure adjustable perf/score/slit, to the tireless pneumatic heads, to the conveyor outfeed delivery, everything about the GW 12000 is designed for years of trouble-free operation. The GW 12000 offers all the above and more at a cost per feature and specification unmatched in the industry.